Have you noticed how trendy leading a healthy lifestyle has become? Well, we certainly have, which is why we decided to draw your attention to something, which is pretty essential if you’re really opting for being fit, healthy and in tune with your inner chi. Rather than focusing solely on the ways in which you could detoxify your body from all the toxins, it’s time to also consider working towards making your place toxin-free. Actually research has concluded that an average home contains around 1000 chemicals – most of which we cannot even notice with any of our senses. And don’t worry – those toxins in small doses won’t kill you, however, if combined with others and in bigger doses then they might turn quite problematic for your health. And if you’re now rushing to convince yourself ‘Chemicals at home? No, way!’. now let me throw some light on where these chemicals come from. Think about your home during the cold winter day. Did you have any idea that the air you’re inhaling is around 5 times more polluted than the air outside? And the main reason behind that is that while home insulation keeps your flat all cosy and warm, it also stands in the way of the fresh air to come in. And now… of course – the cleaning products we use – guess what, even though this might not be added to their content labels – most of them are so rich in toxic chemicals that it might turn out much more sensible to swap them with pure water instead. Bad news, same applies to most of the beauty and pet products that we bring to our homes. And for those of you who live in a house with a lawn to take care of – the pesticides are used to get rid of the plant pest also kill the organisms that control these pests. Also, various studies have pointed out that most of the lawn chemicals are quite poisonous for our bodies too. 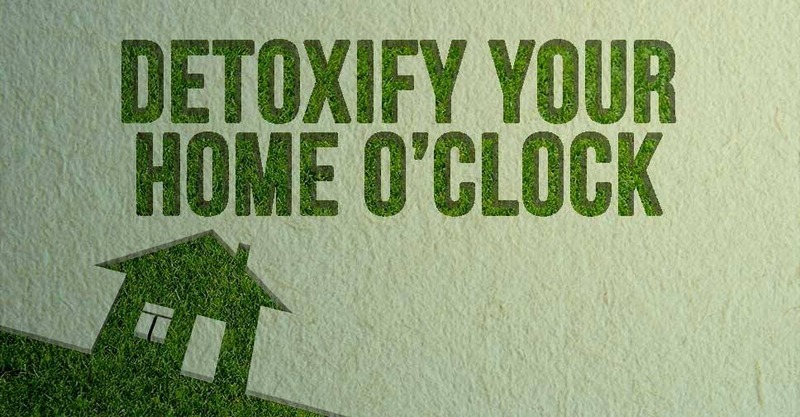 After all that said – here you go a few cheeky tips for how to detoxify your home too. No matter the weather outside, we suggest you leave the windows opened for as much time as you possibly could. Keeping more plants at home will also facilitate the natural detoxification of the air. Also, rather than using artificial sprays to give your place a pleasant and inviting scent, go for bowls filled with fresh seasonal flowers instead. – seriously, entering your home wearing your dirty shoes means letting more germs, bacteria, pesticides and other nasty stuff inside your home. Just leave your slippers near the door and put them on as soon as you get in. 3. Replace the conventional products you buy with greener ones. And when we talk ‘products’, we don’t mean just the cleaning agents, but also stuff you apply on your body and skin. When it comes to your household – you can always replace the bleach with vinegar, and start using baking soda for scrubbing. And whenever you reach out for a new ‘product ‘– make sure to check the labels and do some research around them if you find them dodgy. – Make sure to mop all surfaces at least twice a week and vacuum clean the floor at least once a week, or more if you keep any pets at home. – Whenever you can, use alternatives to the so-called “tupperware”. For example, why not try out using glass ones instead? Also, avoid using children’s toys which have “3″ or “PVC’’ mark on them as well as plastic curtains in your bathroom. Also, make sure to immediately remove the clothes from the dry cleaner’s plastic wraps as soon as you go back home. 6. Stop nourishing the mold! – Mold needs moisture to exist, so make sure to regularly check for any moisture leaks around you place which occur mainly around tubes and showers, and in the basements. to prevent ingesting more than 500 chemicals that could be identified in the water. In other words, avoid using bedding and clothing that contains formaldehyde. In that sense, opt for natural cotton rugs and natural fiber wool and exchange the wall-to-wall carpeting with ceramic tiles and hardwood floors. you use and avoid using toxic pest control. if you spend time in the room that’s being repainted. which are mostly found in chimneys, gas stoves, gas water heaters) as well as regularly check the radon (could cause lung cancer) levels within your home. Radon is a gas formed when the uranium found in the rock/soil breaks down. So to ensure that the radon levels remain low – ventilate your basement which is the place most likely to have cracks on the walls. – no matter how much effort you put in detoxifying your home by paying attention to the products you use and habits you have, remember – you attitude is also pretty essential. Swap the negative energy with happiness, love and positive attitude. We promise you – wonders will happen.